While the property world is being transformed by PropTech, a comparison between most developer-led consultations with those of the late twentieth century would suggest that little has changed: today’s consultations appear to rely on newsletters, exhibitions and paper surveys, just as they did then. And yet innovative and effective communications tools exist, and have the potential to revolutionise consultation. It was the absence of accessible best practice in modern methods of communication that led me to write Public Consultation and Community Involvement in Planning: a twenty-first century guide. The book shows how consultation has moved with the times and the planning process is has benefitted as a result. The communications revolution has brought about an explosion of data (from ‘big’ and extremely detailed), unparalleled access to information, opportunities to reach millions at the touch of a button, improved dialogue, non-hierarchical communications, more agile research tools, and significantly improved means of analysis. Internet usage is increasing year on year. In 2016 no fewer than 99.2% of adults aged 16-24 were recent internet users and although the older population has some way to go before it reaches saturation point, it is the fastest growing group. The way in which we use the internet also continues to grow and diversify. 61% adults use social media and 70% regularly access the internet using a mobile phone or smartphone – double the proportion five years previously. Technological changes have, without doubt, had the greatest impact on communication so far this century. Choice: seeking information on Local Plan formation, policies and planning applications though search engines, recommendations, news feeds and niche sites. Conversation: discussing proposed schemes on forums, blogs and microblogs; taking conversations into new forums (such as those of special interest groups). As the capabilities of the internet grow, the opportunities for involvement within each of these categories will increase and individuals’ behaviour online will become increasingly powerful. The internet has had a huge influence on planning, perhaps more so than any piece of legislation. And unlike legislation, the surge in online communication cannot be reversed. Following the ‘digital by default’ transformation programme and the establishment of the Planning Portal, central Government communications on planning is primarily online; similarly all Local Plan and planning application consultations are hosted online by local authorities, and with the rise of ‘hyperlocal’ websites and online campaigning, stakeholder groups connected to planning decisions can communicate online very effectively. Developers opting not to have an online presence, or those who install a website with no mechanism for dialogue, run the risk of their scheme being debated on closed blogs and Facebook groups and consequently will be unaware of any mounting objection until it becomes too late. Currently 12% planning applications fail to gain planning consent because of issues related to consultation and community engagement. By targeting residents via their preferred means, the likelihood of widespread engagement and support is increased. Users can take part in an online consultation where they want – at home or on the move and when they want. 79% ConsultOnline users take part in consultations using smart phones or tablets and a large proportion respond late at night. Online consultation has the power to reach new audiences – particularly the young and the time-poor. The average age of residents taking part in an online consultation is 35 – 44: typically young parents who work, perhaps commute, and have little time to attend evening meetings. In a busy public meeting, attendees frequently defer to a dominating character or group leader; whereas online, individuals are more likely to voice their opinions without fear of repercussions. There is no single ‘right’ method of consultation and given the range of stakeholders in any one community, a variety is always beneficial. The internet has enabled the toolbox of consultation techniques to be expanded considerably as these examples show. The days of informing the public on a development proposal and collating results at the end of the process is over. Online communication is ongoing, fast and responsive, enabling the consultor to become aware of, to understand, and to correct any misconceptions immediately. Consultation using specially developed consultation websites put in place by the consulting organisation (sometimes as microsite attached to an existing website). A multimedia stakeholder engagement platform that enables the publishing of time-limited consultations and discussion forums. Organisers present information through a variety of media and pose questions, and participants place virtual ‘sticky notes’ in response. The internet has brought about a research renaissance. It has enabled detailed research to inform consultation strategies, create an understanding of local communities and ensure that appropriate dialogue methods are selected. Stakeholder mapping literally ‘maps’ a community, assessing the power and influence of individuals and gauging their likely reaction to specific issues. A more scientific approach has also been taken towards monitoring, analysis and evaluation. The ConsultOnline model allows all data collected, from comments in meetings or in writing to online polls, to be processed through a consultation website, facilitating up to date consultation reports as required, at the touch of a button. It is hard imagine that previously the developer would have had little knowledge of resident sentiment until the end of the consultation. Today, we have the tools to easily identify emerging themes, possible misapprehensions and potential ‘ambassadors’. There is undoubtedly some every effective innovation in the planning world, but modern methods of communication are far from universal. Of course online consultation cannot replace offline consultation entirely until 100% of any local community is able and willing to communicate online. To some, a screen will never compensate for a human and for that reason face-to-contact should remain. 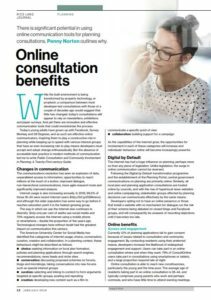 However, there are many advantages of online consultation: it is popular and accessible, time and cost effective, clear and uncomplicated; information can be immediately available and discussions open to all, and evaluation is substantially more sophisticated than previously. It is important that the planning world doesn’t lag behind the communications abilities of the stakeholder groups with which it communicates. Today’s young adults have grown up with Facebook, Survey Monkey and 38 Degrees, and as such are effective online communicators. Inspiring them play a constructive role in planning, while also keeping up to speed with the various interest groups which have an ever-increasing role to play, requires the development industry to accept and adopt change enthusiastically. Penny Norton is the director of PNPR and runs ConsultOnline, on online consultation service. Public Consultation and Community Involvement in Planning: a twenty-first century guide was published by Routledge in July 2017.